The Independent Order of Odd Fellows is a fraternal organization that was founded in 1863. Many members included prominent civic leaders. This display commemorates the 150 year anniversary of the organization. 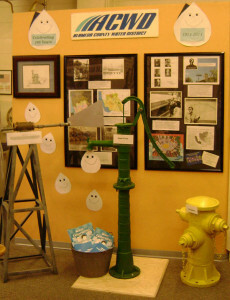 The first of these exhibits will focus on the Alameda County Water District (ACWD), and it will include photographs as well as the story of how the District was formed. Additionally, we will have various items on display from the ACWD. Don Dillon established Four Winds Growers with his father in 1954. The nursery is still operated by the Dillon Family. Don was active in Fremont City politics as City Councilman and Mayor when Fremont was developing from five small towns into a city. Democracy on Exhibit (PDF) — An article about the Museum’s “Democracy on Exhibit” which was published in the September 26, 2003 edition of the San Francisco Chronicle.